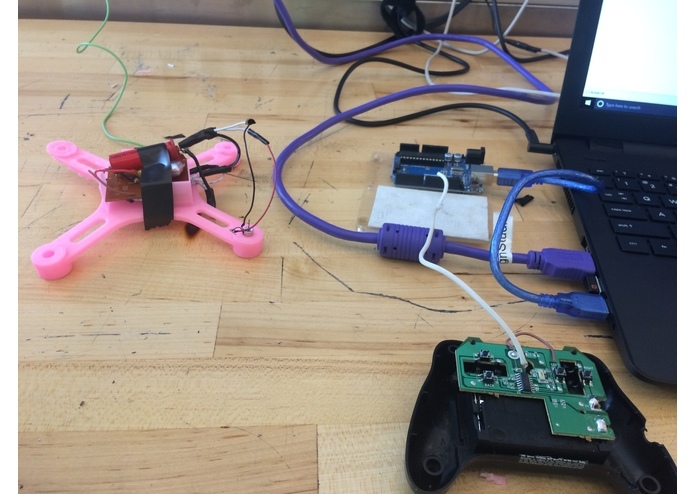 Our inspiration for this project came from the fact that we are intrigued by connecting the hardware aspect of engineering to the powerful software side, more specifically, we wanted to create a drone that could be controlled and programmed from a laptop. We also wanted to account for cost and hackability, so we plan on constructing the drone from an old RC car allowing for it to be a user-friendly, flexible and affordable platform using 3D printed materials. The IntelliDrone functions as a normal drone, however is different in the sense that it can be controlled and programmed from any laptop (assuming arduino IDE is downloaded). In order to build IntelliDrone, we utilized an RC Car Radio receiver and transmitter, Arduino, the Arduino IDE and the power of our laptops. We took apart an RC car and used its components to prototype the drone. The drone will be created by soldering motors onto parts of the receiver, therefore changing its function, we then planned to hook up the Transmitter/controller to the arduino. This aspect makes it easier for anyone to recreate this hackable system, as we also documented our process on GitHub. We then wrote code which allowed the Arduino to understand that when certain keys were pressed it had to instruct the transmitter to do certain things, therefore controlling the drone. 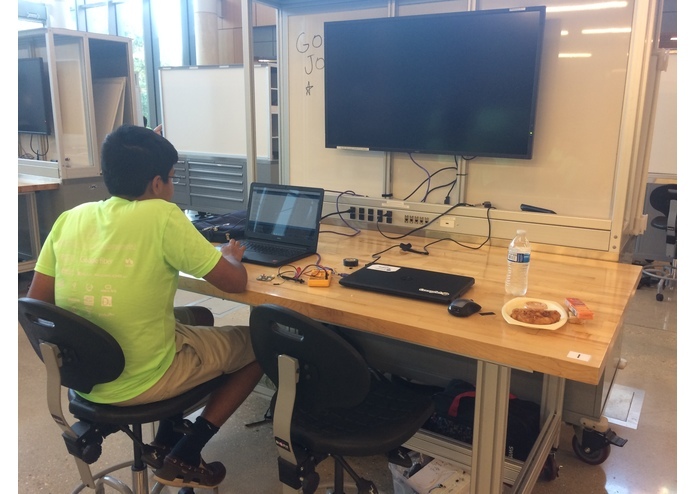 The most challenging part of the project was to gain insight into a lot of electronics and modify a complex object such as a radio receiver to amplify the input to drive four motors on the drone. The most interesting part of this challenge was to create a prototype with tools that were hard to get access to, so we had to communicate and coordinate with a lot of new peers to gain access to those tools if they had it. Although it was hard, at the same time, it was also fun to discover what they were working on and make new friends. We successfully deployed a prototype of a single motor on a 3D printed frame just like we envisioned. We are proud to complete a project goal in one night, so that we can continue reiterating through the design process to improve the effectiveness of hackable and custom programmable drones. Not only that, it was probably our first time working on a self-created project throughout the night with a team and that was very exciting. Throughout this process of creating this idea and prototyping it, we have increased our knowledge of transmitters and receivers, and have also been able to gain experience programming in Arduino. Possibly the greatest takeaway from this project is how Software and Hardware can be integrated with each other to such an extent that a couple of words on a keyboard can control the flight of a drone, which is unbelievably amazing. We hope to continue to build upon this idea as it is not entirely finished and like any other idea can always be improved upon. In the future we hope to create a library of pre-programmed functions which would encourage and inspire IntelliDrone users.